Wilson Hartnell (WH) was asked to develop a communications campaign around International Clinical Trials Day on Wednesday, 20th May 2015 on behalf of the All Ireland Cooperative Research Group (ICORG). Currently, one in three people will be diagnosed with cancer during their lifetime in Ireland but myths about clinical trials still exist which result in many people seeing clinical trials as a last option or a negative experience. The challenge was to dispel the common misconceptions about clinical trials and to encourage an increased level of participation in clinical trials. The main objectives of this campaign included raising awareness of clinical trials in oncology in Ireland amongst the general public, encouraging those affected by cancer to ask their clinician about clinical trials as a treatment option and to raise awareness of the vital role ICORG plays in clinical trials and cancer research in Ireland. We were tasked with launching the communications campaign to raise awareness among three priority groups: the general public, healthcare professionals and stakeholders. In order to deliver a campaign offering hope to people living with cancer and ensure greater numbers of people ask their consultant about clinical trials, we focused on the positive stories of people who have participated in clinical trials in Ireland. Every year hundreds of patients voluntarily participate in clinical trials and research, helping to pave the way for improved cancer treatment. These people’s stories formed the basis of all communications activity around International Clinical Trials Day. These people were our ‘Clinical Trial Champions’. 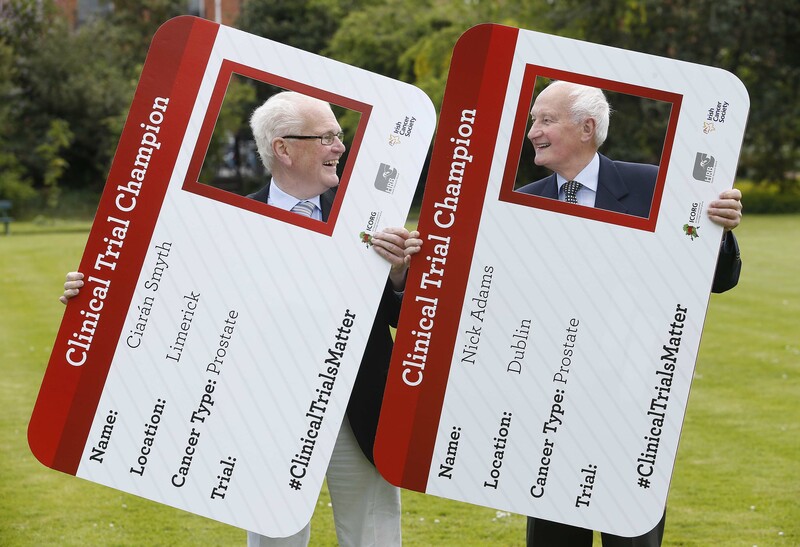 We developed a personal and engaging concept for a national photocall on International clinical Trials Day. The photocall featured Evelyn O’Rourke, Eibhlin Mulroe and Ray McDermott from ICORG, Dr Robert O’Connor from the Irish Cancer Society, Ms Gillian Markey from the Health Research Board, Mr Oliver O’Connor from IPHA and six ‘Clinical Trial Champions’ from around the country, representing different areas, trials and situations – all with their own stories but with something in common – a positive attitude towards clinical trials. Alongside traditional media relations activity we developed a social strategy to help create awareness and encourage those affected by cancer to ask about clinical trials as a treatment option. We designed content for new pages on the ICORG website to provide information on clinical trials and to encourage people to get involved. We profiled each Clinical Trial Champion and displayed an image and case study for each champion on the ICORG website, offering an insight into the real life experience of those affected by cancer and helping to dispel the myths around clinical trials. We also worked with ICORG to maximise their existing social media platforms. We developed various visual assets for the campaign including an informative infographic to support the key campaign messages and show the progress that is being made in the area of clinical trials. To support our media relations campaign we conducted a survey among people who have had cancer or who are currently living with cancer to understand the views and barriers to clinical trial participation. The results of the research were used to highlight the barriers to participation and the current opinions about clinical trials. The media relations campaign which put the ‘Clinical Trial Champions’ at the heart of all activity resulted in positive coverage which delivered the key campaign messages across national , regional, online and social media with a total advertising value of €142,268.50 and a PR value of €426,805.50. Coverage highlights include the Irish Times, RTE’s Morning Ireland and RTE’s The John Murray Show. We successful placed eight case studies across national and regional media to show the real life experience of people affected by cancer. The campaign strengthened existing stakeholder relationships in addition to creating new relationships within the industry and relevant media.